5 Lehenga Shops in Kolkata You Must Check Out for Gorgeous Bridal Wear! So you are getting married in the city of joy? Or maybe you want to check out the top lehenga shops before you decide on the outfit that you will rock on the D-Day! Whatever it is, you have come to the right place. We can give you the best tips on bridal shopping in Kolkata and you will surely love us for that! When shopping for bridal wear in Kolkata, there are a few places that you absolutely must check out for their gorgeous stuff. We have the list of top five such places where you can get lehengas that every bride desires. From your lavish wedding lehenga to that simple haldi outfit – we have the fix to all of your bridal shopping needs! Mrs. Lata Harlalka established this designer boutique in 1998 and they have been dressing brides in gorgeous bridal lehengas and other outfits since their inception. The store now has branches in Jaipur, Jamshedpur and Cuttack. From party wear to lavish bridal outfits – this is where you will find everything listed under your bridal shopping checklist in Kolkata. This bridal boutique was setup by designer duo Mayanka Agarwal and Rachit and soon became one of the most sought after names in the industry. They also have designer lehenga cholis from Harpeet Narula, Anjali Arjun, Rohit Bahl, Paras and Shalini and others. Here, you can expect to find a fusion of the very best of conventional and contemporary bridal outfits. When in Kolkata, you much schedule a visit to this store for your bridal outfit. With the tagline, “We design lives not clothes”, Sejal Kanoi is truly a place for bridal shopping in Kolkata where you can get your hands on some amazing stuff. They are an exclusive store and only located in Kolkata, making them a must visit. If you are looking for some affordable wedding lehengas in Kolkata, they can create some unique designs for you! Where: 2A, Sarat Bose Road, Kolkata 700020. This boutique has multiple options for bridal designer wear and you are sure to find something for your special day. Rohit Bahl, Rocky S, Tarun Tahiliani and Manish Arora are some of the many designers who contribute to Vedam. Sarees, wedding gowns, lehenga cholis, jackets, tunis, grooms wear and accessories – they have it all. With more than 25 designers in one place, it’s surely one of the best places to shop for bridal wear in Kolkata. When in the land of the master himself, how can you give this one a miss? With regal designs, intricate work and luxurious works, his designer bridal lehengas are to die for! 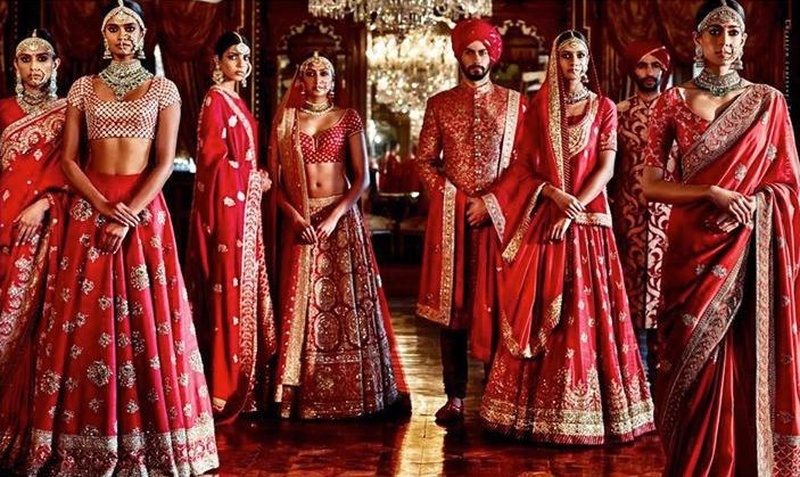 Using unusual fabrics, blending different styles, patch working and creating a vibrant piece of art is what makes him stand apart and to be a Sabyasachi bride is a thing every girl dreams about! Now, that’s what we call saving the best for the last!